Life has drastically modified the composition of Earth's atmosphere. Future telescopes will be capable of measuring the atmospheric composition of terrestrial exoplanets to look for signs of life. In preparation for those observations, I work on developing quantitative metrics for the amount of disequilibrium in planetary atmospheres, which could reflect the influence of biology. The Earth's climate has been remarkably stable over the last 4 billion years despite increasing solar luminosity. Traditionally, this 'faint young sun paradox' has been explained by the continental weathering thermostat: warmer temperatures result in enhanced continental weathering, which removes carbon dioxide from the atmosphere and thereby cools the climate. However, seafloor weathering is a complementary feedback that may have played an important role on the early Earth. To explore these ideas I have developed a carbon cycle model which incorporates the kinetics of seafloor weathering. Additionally, the model will be used to constrain the surface conditions of the early Earth, which may inform competing hypothesis on the origin and early evolution of life. How and why Earth's atmosphere became oxygen rich is a topic of intense debate. We know the ultimate source of (almost) all atmospheric oxygen is life, but evidence suggests oxygenic photosynthesis evolved hundreds millions of years before oxygen levels in the atmosphere increased. I have analyzed the carbon isotope record - which tracks organic carbon burial and therefore the oxygen source flux - to determine whether changes in oxygen sources alone can explain the rise of oxygen, or whether changes in oxygen sinks need to be invoked. Will we find life on exoplanets the near future? In collaboration with Ryan Garland and Patrick Irwin at the University of Oxford, I have simulated observations of Earth-like planets with the upcoming James Webb Space Telescope (launch scheduled 2021) to see if disequilibrium biosignatures are potentially detectable, and to determine the most favorable observing strategies and targets. For the next-generation of telescopes capable of imaging terrestrial exoplanets, observing time will be in high demand. 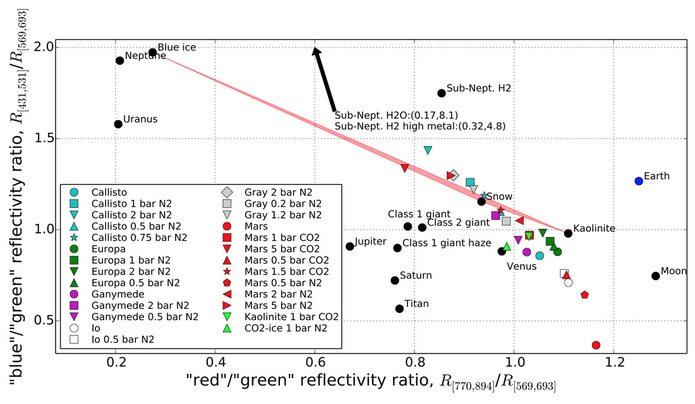 I have explored whether planet color could be used as a quick-and-dirty indicator of potential habitability, and whether color could be used to prioritize targets for follow-up observations.